We returned home to New York only to find that I was stricken with a terrible cold, the kind of cold that makes me even more cranky than normal. I had most of the early part of the day to kick around, grumble, and drink ginger, lemon, and honey tea so by the time Jen got home I was only mostly insufferable. As I've mentioned many times it is nearly impossible to pair beer or wine with soup. Since I'd planned to make soup I decided to have a beer about two hours before the soup to make things easier. 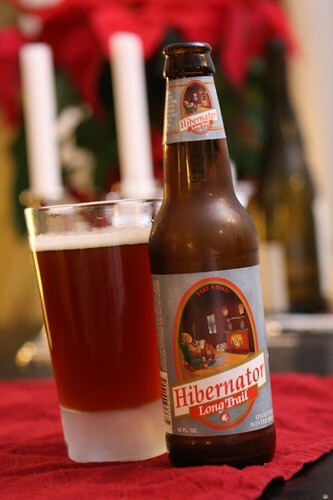 Tonight I selected this Hibernator from Long Trail Brewing Co. As we roll into the near winter months it will be all about Christmas and winter beers. There are probably 400 different varieties that I will see this year so I'll need to be extra selective about what I choose to pair with dinner and what I don't get around to sampling at all. Given my love for Long Trail I thought this was a good way to kick off the winter season. And by winter season I mean winter beer season, not actual winter. With my cold lingering I decided soup would be a good move. I took some of the remaining turkey from Thanksgiving and spent most of the day making turkey stock. 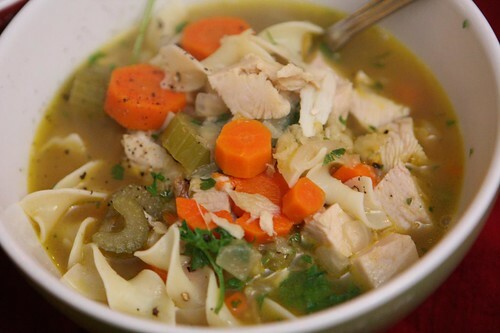 With some of the stock I made this turkey soup with garlic, ginger, onion, carrot, celery, egg noodles, parsley, and lots of black pepper. I also put in a dash of Worchestershire sauce at Jen's recommendation and I'm pretty sure all of that added up to clearing out my sinuses nicely. 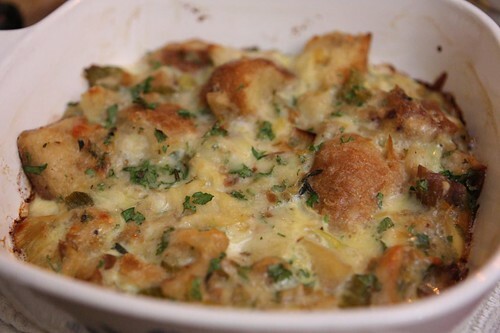 Jen's not a huge fan of soup as a main course so I also took the remaining stuffing and added an egg, some Gruyere, parsley, and a little milk before baking it in the oven to make a savory bread pudding. I was going to go straight back to tea and add a little brandy but then I decided that leaving the tea out may be a better idea. I did cut the brandy with a little Bénédictine for the herbal and medicinal qualities of the drink. Then I sipped it over the course of about two hours. 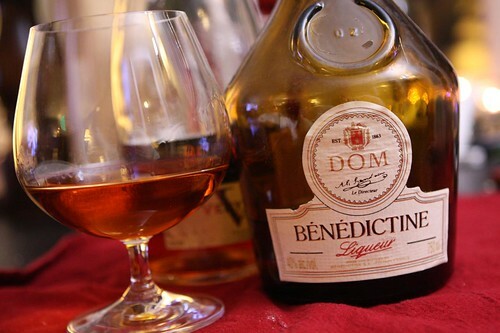 Bénédictine is made by monks so it has a long tradition and closely guarded recipe. Besides, I just like anything made by monks.